At a recent visit to Giugiaro, this 50-year-old unnamed Lamborghini, never before seen, suddenly appeared like an undiscovered Shakespeare manuscript, discreetly displayed in a library with no one paying attention. Parked under some Greek temple-like stairs at the Giugiaro Design headquarters, the car sat on its period Borranis, painted in a yellow hue unseen this side of Ducati. No details, no background, but the story is simple: Fabrizio Giugiaro found some of his father's old sketches from the Bertone era (1960-1965). He digitized one of them, milled it, painted it, put on wheels, headlamps, some brightwork around the windows and a period numberplate. "Happy Birthday father," he then proclaimed on Giugiaro's 70th birthday. "This is actually from you to us, but we made it for you." So what is it –- apart from a beautiful birthday present? The drawings were marked "Lamborghini," and though the first Lamborghini was presented at the 1963 Torino motor show, the Torino design community had known for a while that a new Italian supercar was about to be born. Uninvited Pininfarina, Ghia, Vignale, Michelotti and certainly many more (Bertone confirmed that they too, had participated) submitted proposals, without knowing too much about the project. A design by ex-Bertone (now freelance) designer Franco Scaglione was eventually chosen, but it disappointed many –- even Ferrucio Lamborghini himself admitted it might have been a mistake so he sent it to Touring to have it reworked. We have never seen any of the other designs so it is impossible to get an idea of how the original Lamborghini might have looked. But this sculpture might give an idea of what Bertone intended. It is entirely different from all the other designs Giugiaro created during his time at Bertone, but that's no surprise. Giugiaro worked on super-disciplined production cars like the Alfa 2000 Sprint, Gordon Keeble, Fiat 850 Spider or Mazda Luce 1500 at the same time as free-wheeling fantasies like the Aston DB4 Jet, the Corvair Testudo (sold at Villa d'Este this summer to a businessman from Milan and now back at Giugiaro headquarters) or the Alfa Romeo Canguro. Most of the 25 "officially credited" creations he worked on while at Bertone are nothing short of masterpieces. This Lamborghini is completely different from both the other designs he worked on during that period and what everyone else was doing at the time. The flowing – some might say bulbous – lines recall the Ferrari P3 and P4, but those cars appeared years after young Giugiaro sketched these lines. There wasn't anything in the Ferrari/Pininfarina portfolio that could have inspired these looks either. 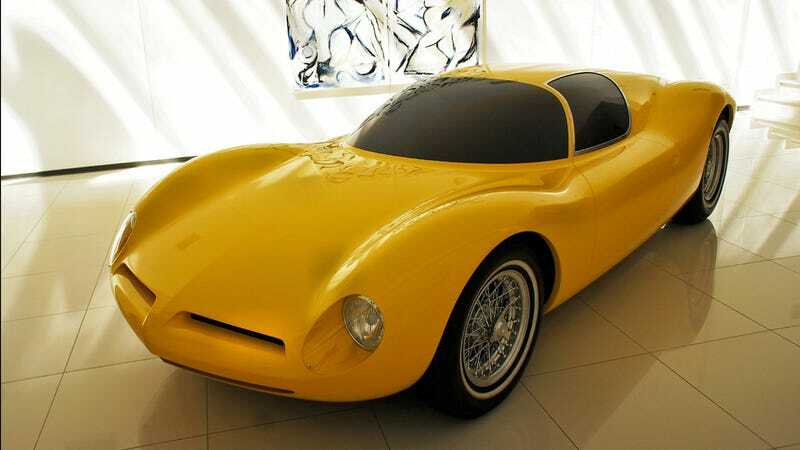 The 250 GT SWB, the 250 GT Berlinetta or the 400 Superfast were far removed from this concept car. Pininfarina's Corvair – the Coupé Speciale – was but a pale demonstration of what that car might become. And looking at the Testudo born at the same time, it was clearly evident who the original thinker behind the car was. The flying buttresses on the Giugiaro Lamborghini are extremely interesting. If Scaglione had continued developing his BAT-series perhaps something similar might have appeared earlier. But he did not -– this aesthetic was only publicly revealed on the Ferrari 250 LM Berlinetta, a car that appeared after these sketches were done. The Dodges with similar treatment ("fin shaped rear uprights" was Pininfarina's translated explanation in the late 1960s –- it was coined 'tunnel back' in the U.S.) did not appear until 1968-69. So if this was a proposal for the Lamborghini debutante, why was it discarded? The weak front cannot be the explanation; that could easily be modified. The reason was probably that Lamborghini was after a car with a Gran Turismo image, not an uncompromising two seat sports car with track attitude. For Bertone it was no disaster; he got his name on both the Miura and Espada –- two milestones if ever there were any. But Giorgetto Giugiaro must have been disappointed and, after a lifetime at the top, there hasn't been any Lamborghini to officially wear with his signature. Was he reminded of that when he saw this car? And was that why he re-ignited the "who did the Miura" discussion some time ago (he stated fairly clearly that the P 400 was as much his as it was Gandini's)? Pure speculation, but we'll ask him next time. This story originally appeared on Car Design News on July 19, 2011, and was republished with permission.